Tooting Market is a true hidden treasure. 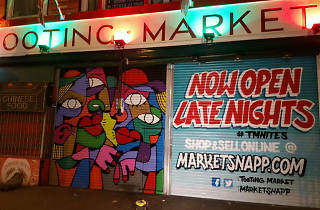 Although it’s been in existence since 1930, the recent addition of some hip new stalls has seen the market rejuvenated. There are numerous food, booze and vintage shops, plus some excellent spots to sit down for a drink, including the excellent Secret Bar and Unwined. Everything you need under one roof. Seriously. Health foods, gin, wine, pizza, British chocolate, nail bars and the best fabric shops in South London. By night the market comes alive as Toting foodies tuck in to the amazing restaurants the market has to offer. Love it! It's an emerging gem in the heart of Tooting's SW London crown. It's getting better every day, and there are myriad places to eat and drink, as well as the usual quirky London market stalls and shops. The comic book guy is awesome, if you're into that. It's getting an increasingly Brixton-esque vibe and I love it! Tooting market is fantastic and just seems to be getting better and better! A great mix of shops and bars/restaurants means that there is a buzz no matter what time you go through! Hopefully the CrossRail2 plans do not take it away from Tooting! Tooting Market is fantastic. I don't like to compare it to others, as it is unique in its own right. There is lots on offer from breakfast to dinner and every week there appears to be an addition of new restaurants and stall holders, which is great! I know it's under threat from the new cross rail and hope there is a way to integrate both, so Tooting can have the best of both. This place is a little gem in Tooting. No it doesn't rival Brixton or Camden Markets, but its a great place for locals to grab a bite and a bargain. There are also a fair few wine and beer bars, so would be interested to go in the evening. Went for coffee and lunch at Brickwood, which is always bustling. My favorite place in Tooting. So eclectic. Reasonable prices. Brilliantly eclectic. Get your nails done for £8. Grab a coffee, a cheap table cloth and a pot of noodles. From the array of places to eat (Meza, Franco Manca, Brickwood, Unwined) to Graveney Gin bar and the selection of market shops such as RaraBazaar, this place is a little gem in Tooting! You could definitely spend a Saturday or Sunday afternoon roaming around in here. A must visit in Tooting! It is a great asset to the community providing goods that have disappeared from the High Street. Also, the recent additions have really livened it up. Everything you need in one place! Become such a buzz!! So much going on and changing all the time, but without loosing its soul. An institution! Tooting without Tooting Market is like... toast without butter! Chips without ketchup! Chapati without the channa! So full of life and colours. This is why we love living in Tooting. It still has a mix of cultures and hasn't been completely taken over by the newcomers. All stallholders seem to rub long nicely. Really great multicultural market. One of those wonderful places which makes Tooting what it is. A real gem of the place, where you can eat, shop, treat yourself and have a dress made! Dare I liken it to Bangkok night market? Now you can grab a bite to eat long into the night. Brilliant place, buzzing and so unique. Let's hope it never gets too gentrified a la Brixton Market and retains its character. 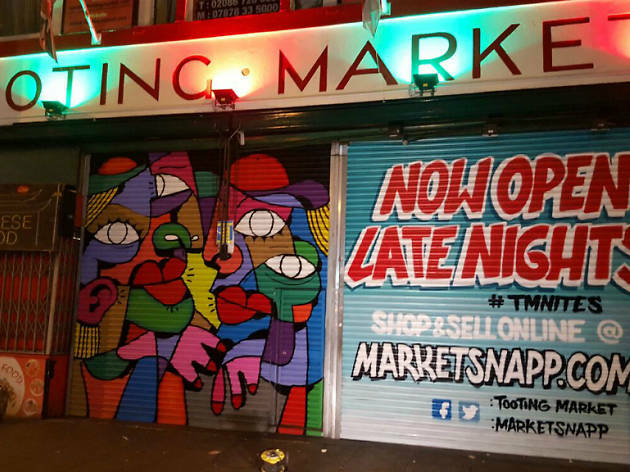 Tooting Market is going through a bit of a refresher - gone are the empty units collecting dust, and in their place are great food outlets reminiscent of Brixton Market and nearby Balham High Road. We Brought Beer is here, as is Graveney Gin distillery, a new Franco Manca and Brickwood cafe. All this alongside the usual grocers and stalls selling a wide array of goods from around the world. Really good to see new life in the place, and also people stopping to spend money on something more than £1 bowls of fruit and veg (which are - might I add - also brilliant! ).